That’s from a letter sent to me by Assistant Chief Constable (ACC) Andy Taylor, writing with the advice of the licensing manager Zoey Evans, in February 2010. If that was the case in 2010 why, in 2016, is TVP handing out S7 permits like sweets at a kids’ party? The answer is simple – lousy management. Let’s see how it works in practice. Joe’s shotgun certificate (SGC) expires in mid January 2017. In mid July Zoey wrote to say she was sending out the reminder six months in advance. She blamed this on what she called the ‘peak renewal period’ and the demands it places on other departments such as Finance and the Information Research Bureau. What Zoey likes to call the peak renewal period is in fact the normal period. Twenty years ago certificate life was extended from three to five years which resulted in differing workloads over the new cycle – three normal years and two with much less work but over time this has evened out. Zoey’s excuse is a feeble attempt to cover up for poor performance. The cycle is easily planned for but TVP has not done so. The one thing I have never heard complaints about is the speed with which forces cash the applicant’s cheque – within a week in most cases. I’m unable to comment on the work of the Information Research Bureau (which sounds like something from the dark side of a John Le Carré novel!) but surely in this digital age it can’t take that long to see if an applicant has a skeleton in the cupboard. Joe is good with paperwork and in early August returns the forms. On 25 August Zoey writes again saying that due to the “peak renewal period” she may be unable to process his application prior to the expiry date – then still 4½ months away. Keen to exacerbate the problem rather than resolve it Zoey issues Joe with an S7 permit valid from mid January to mid July 2017. In other words she’s saying it could take up to 10½ months to renew the certificate. If Zoey can issue an S7 permit so quickly why can’t she just renew the certificate? In 2015-16 TVP received 4,005 applications for the renewal of an SGC and refused 10 – 0.25 per cent. In 2014-15 the refusal rate was 0.16 per cent. Nationally refusal rates for SGC renewals have been remarkably consistent since records began in 1983 and rarely exceed 0.2 per cent. In other words the risk attached to automatic renewal is negligible. Based on the experience of Matt, Joe may not get his certificate by July 2017. Matt’s certificate expired on 25 February 2016. He applied for renewal in November 2015 and his cheque was cashed on 19th. Concerned at the lack of any obvious response he emailed TVP on 1 February to enquire about progress. Such enquiries should not be necessary and take up time in the licensing department that could be put to more profitable use. Tony Khan replied on 3rd saying that an S7 would be issued to run from the date of the certificate’s expiry. The S7, with an expiry date of 25 August, duly arrived but on 12th August Matt had to email again as there was no sign of a certificate. Tony Khan replied on 16th to say the certificate had been renewed but had not been printed – another feeble excuse. He was unable to offer a delivery date. In the event the certificate was dated 6 September, 11 days after the S7 expired during which time Matt was in unlawful possession albeit with the active connivance of the Chief Constable. An S7 allows you to possess shotguns and buy ammunition and for many people is an adequate short term solution. However for a firearms certificate (FAC) holder the situation is less rosy. Owing to a quirk in the law you cannot hold expanding ammunition on an S7. Expanding ammunition is a legal requirement for deer stalking and good practice for all other live quarry shooting. In effect the S7 allows you to keep your rifle but not use it. Andy’s coterminous certificates expired on 14 August 2016. He applied for renewal in March and his cheque was cashed on 11 April. He was not issued with an S7. On 5 August he phoned to enquire about progress and was assured the renewal was in hand. He was told he would not get the certificate until the FEO visited which might be any time in the following six weeks. He eventually received his certificate, dated 26 September, in early November. The police had deliberately left him in unlawful possession for six weeks! Another FAC holder, Don, was told in August in an unsigned letter from Tony Khan that “due to restrictions surrounding expanding ammunition conditions on temporary permits your FAC is renewed for the next five years. You are fully covered to shoot as normal under the usual terms of your full certificate. We are unable to forward the printed hard copy until all processes have been completed in retrospect but if you are challenged to produce any paperwork not to hand, police officers do have 24 hour access to our system”. Whilst it’s true the police have access to the database, dealers and others with whom Don may need to do business do not. An unsigned letter is not an FAC ! Since April I have been nagging DCI Colin Black, Zoey’s supervisor, to organise a user’s meeting. I was told in early 2016 they were held every 18 months but the last minuted one was held in 2012. My requests have been ignored which suggests little interest in customer concerns. Shortly before this went to press I had a meeting with ACC Hogg who has recently taken over responsibility for firearms licensing. I am optimistic that change will happen. 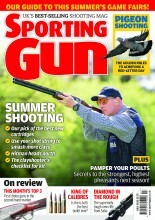 David Frost is the author of Sporting Shooting and the Law which can be obtained from the NGO.